In what appears to be a first-of-its-kind piece of legislation, France has enacted a law that criminalizes “psychological abuse” by one spouse against another. The law applies to cohabiting couples as well as married couples. The law is expected to cover a wide variety of verbal behavior, including repeated rude remarks, insults, false allegations of mis-behavior, and verbal threats of physical violence. French police have been urged to issue a caution for first offenses, but repeat offenders could face fines, restraining orders, and even jail time. You can read an interesting article about the French law from Jonathan Turley here, and an article from Dailymail.com here. How do you feel about the French law? Do you think it is a good idea? Or, is this an example of too much government intrusion into private lives? 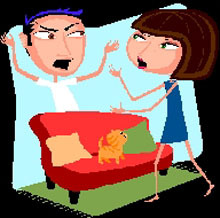 Is nagging considered a crime? Let us know what you think – is this a CIVIL RIGHT or a CIVIL WRONG? This entry was posted in human rights, International Law, violence against women and children and tagged Add new tag, France, Jonathan Turley, Law, Law of France, Marriage, police, Psychological abuse, Violence and Abuse. Bookmark the permalink.